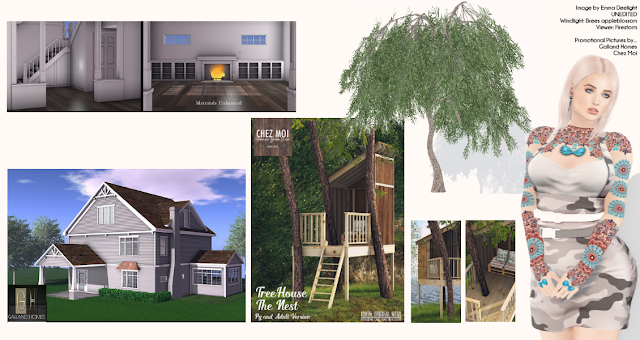 Today I am featuring Kaithleen's, Chez Moi, The Little Branch and Galland Homes @ U L T R A, Carol G and Q Poses @ Cosmopolitan and Runaway @ Hairology. From the current round of U L T R A, I am wearing a cute lil dress from Kaithleen's. It's made for Slink, Belleza and Maitreya. The fatpack includes lots of classic color options. From the Cosmopolitan event I have featured the tattoo from Carol G. It's made for Slink, Belleza, Maitreya, Omega, Bento Vista and neck tattoos for CatWa and Omega. You get four shades. I am wearing 100%. I am posed by the scooter prop from Q Poses. It includes five poses. The phone prop will auto rez for this pose. The poses are easily adjustable. I hope you enjoy today's scooter look.